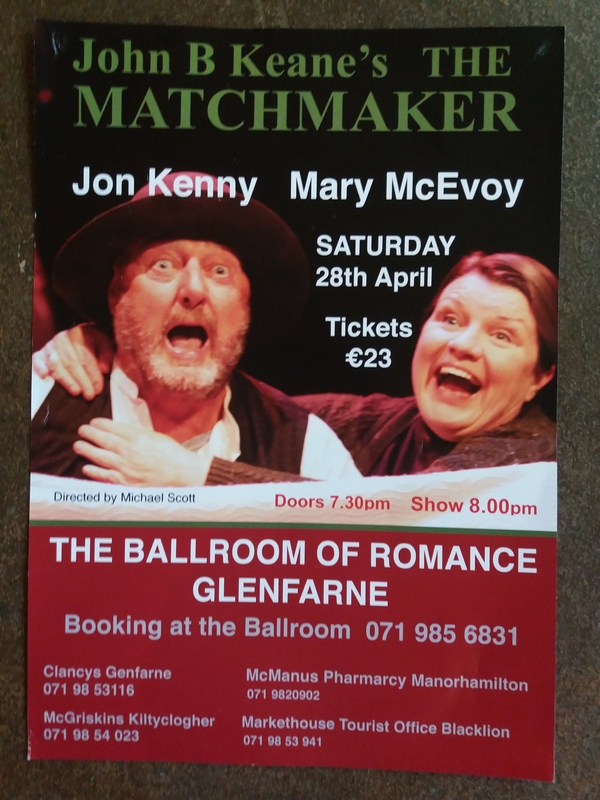 The Matchmaker based on the novella “Letters of a County Matchmaker” by John B. Keane, one of Ireland’s most celebrated writers, will play in The Rainbow, Ballroom of Romance, Glenfarne on Saturday, April 28. The production directed by Michael Scott stars television favorite Mary McEvoy known for her role as Biddie in the long running RTE series Glenroe and actor and comedian Jon Kenny who was part of the Irish comic duo d’Unbelievables with Pat Shortt. Kenny is also best known outside Ireland for appearing in the Channel 4 sitcom Father Ted. Together they play a myriad of characters in this hilarious and earthy dramatic comedy. But for Mary Mc Evoy going back to the Ballroom of Romance will be a trip down memory lane as she and director Michael Scott return to a place that touched their hearts 10 years ago. In 2008 Mary starred under the mirror ball of the famous Ballroom in another of Michael Scotts productions, called “Dancing at the Ballroom”. It brought together professional actors with local people taking part in the performance under the creative guidance of Scott. It was here that the local community made a lasting impression on Mc Evoy. She happily looks back at it in glowing terms describing it as “My favourite gig of all time”, no mean compliment considering Mc Envoy’s acting caliber and career to date, “The locals were amazing” she says recalling how they enthusiastically partook in Scotts project to create what she describes as “lovely community theatre”. People came from far and wide to be part of it. She explains, “the whole community supported it” In fact McEvoy laughs as she warmly adds, “Most of them were in it”! She is looking forward to returning to the ballroom and hopefully catching up with some of those familiar faces when she stars in “The Matchmaker” alongside Jon Kenny. The play follows the efforts of Dicky Mick Dicky O Connor to make matches for the lonely and lovelorn. Keane, an avid observer of people and the cultures that bind and create their view of the world uses “The Matchmaker” as an exploration of rural loneliness. He was also aware that generations of people became masters of their own destinies late in life, and only then began to look for companionship and love, once their duties as minder of aging parents were concluded or they had finally inherited, or were the left over brother or sister. Many of the themes are still very relevant. When a common sight is heads looking down at screens while engrossed in social media “People don’t talk to each other very much anymore’ Mc Evoy observes although she’s more hopeful that our love affair with our phones might be turning sour and people are becoming more aware of the negative aspects to them. She acknowledges still the many positives that the internet has given in reducing social isolation by helping people keep in touch and share common interests. She’d be a firm believer of the importance of becoming computer literate later in life for those kinds of reasons. Other issues are very close to her heart. She’s very passionate about what she sees as the lack of a voice for rural issues, and how she sees contemporary Ireland as “very urban centered” with rural Ireland as being “very neglected”. There’s often ignorance from city dwellers about the day-to-day reality of living in rurally. “There’s a thriving culture of people being ignored,” she says. But even though the play deals with such earthy themes of isolation she says that audiences can look forward to a “very very funny play”! With a focus on loneliness, its not just emotional loneliness, it’s physical too. The characters aren’t backward coming forward as they are frank about those needs. As Mc Evoy says when looking for a match they don’t want to be hard done by, and make sure using Keanes dialogue that “the natural faculties are in fair working order”! Through his inimitable way with words and his sense of “devilment” and wit, Keane delves into the longings, hungers, fears and foibles of this collection of lonely county people and creates a marvelously colourful world, taking us back to a simpler time, when phones were few and far between and the only web was one left behind by spiders. The Matchmaker will no doubt receive a warm welcome returning to old friends and new friends at the Ballroom, April 28. 8pm. Clancy’s Glenfarne: (071) 98 53116; McManus Pharmacy Manorhamilton: (071) 9820902; Mc Griskins Kiltyclogher: (071) 98 54023; Markethouse Tourist Office, Blacklion, Cavan: (071) 98 53941.